Posted on 12 March 2013. Relative still to the ongoing implementation of Bawal ang Epal Dito campaign, the FO2 is employing different mediums to ensure that the Pantawid Pamilyang Pilipino Program will be spared from undue politicking for the upcoming May elections. Aside from the regular tri-media guestings and interviews and production of news releases, the Field Office also started distributing tarpaulins and flyers to the 83 municipalities and 4 cities covered under the program. The Field Office also sent communication to the local chief executives regarding the implementation of the campaign and eventually seeks for their full support to take part in its advocacy by not claiming that they have a hold in the selection and removal of beneficiaries in the program. The “Bawal ang Epal Dito” campaign highlights on the message that only DSWD has the right to remove beneficiaries from the program [Tanging DSWD lang ang may karapatan magtanggal ng pangalan sa Pantawid Pamilyang Pilipino Program] and not any politician who threatens the beneficiaries of being delisted unless they will give their support. The campaign would also like to empower the knowledge of the beneficiaries that they will not be removed from the program unless they are compliant with the conditions for health and education. Meanwhile, the messages of the campaign were also conveyed to the beneficiaries during the conduct of Family Development Sessions. The Pantawid Pamilya is a human development program of the national government. It is also a social protection strategy that invests in the health and education of poor children age 0-14 years old. It is widely known as the Philippine conditional cash transfer program and operates in 1,605 cities and municipalities in 79 provinces in all 17 regions nationwide. A line from a Filipino actress that resided in my mind for a very long time is that; deprived people do not have the right to dream for their future, they have to accept their current condition. I was thinking that the actress’s statement was absolutely right. On the other hand, it so heart breaking and frustrating because I have a dream, a dream for my family, for my children especially. I am a mother of three, namely: Joshua, Marvin and Ronalyn. Yes! We are less fortunate, we do not have the enough providence to be in a state of existence that I want for my family. My husband and I can provide three meals in a day for my children, clothes, a tenable home, love and security. Moreover, sending them to public school is what we can do for their intellectual development however, I fear not to sustain this aspiration for the reason that our financial statement every day is enough for our needs and no superfluous for my dreams, for my children’s dream. My dream for my children is to be in a school, holding a ball pointed pen learning how to write on a paper, learning how to read their books, to pursue and finish their studies. There was a day that I reflected on my dreams and realized that my dreams are not that difficult for other people. Other would dream for a brand new cellular phone while I dream for the tuition fee of my children, others would dream for brand new shoes while I dream for enough school supplies for them, others would dream for quarter pounder hamburger and a French fries while I dream for the contributions of my children at their school. How could I provide all of these things if we only have enough for our needs? How could I fulfill for my dreams if I fear for something. That was the time that the line of an actress in a Filipino movie entered again my mind. That was so heartrending. Dreams are free, we can actually dream for all the dreams that we can and want. Some would just let it always be a dream; some will strive harder for their aspiration in life. Life. Just like “Manang Marivic” and her story of her life as a caring, loving and ambitious mother for her children. Until the Pantawid Pamilyang Pilipino Program kissed the lands of Diadi, Nueva Vizcaya whereinManang Marivic was included as one of the beneficiaries. The program provided Manang Marivic an assistance and opportunity to send her three children at a public school. Now, she fears no more for the reason that she is secured for her dreams, for the education of her children and for the welfare of her family. It took a long time for the line of that actress resided at my mind and it is about time to erase and change my perception in life, Manang Marivic added. In photo: Indigenous People Migrant Families is one of the families in need of special protection which is being catered by the Modified Conditional Cash Transfer. TUGUEGARAO CITY—The Field Office 02 continues with its effort to complete and validate target beneficiaries for the Modified Conditional Cash Transfer. Known as MCCT, it is a modified approach to cater to families in need of special protection who are not captured into the regular Conditional Cash Transfer popularly known as the Pantawid Pamilyang Pilipino Program. Families in need of special protection (FNSP) includes street children and families in pockets of poverty not covered by the Pantawid Pamilya; Indigenous People (IP) Migrant Families; Families with Children with Disabilities, Families of Child Laborers, Displaced Families due to manmade and natural disasters and other FNSP whose children were abused, abandoned and exploited and are not in school. The MCCT is being implemented by the DSWD together with Civil Society Organizations (CSOs) who have the capacity and have existing programs for FNSP. Presently, there are a total of 134 household beneficiaries for the DSWD-Run MCCT; and 1, 268 household beneficiaries for the CSO-Run MCCT. Two CSOs are currently engaged in the implementation of MCCT namely the Green Meadow Development Foundation Incorporated (GMDFI) with 800 households; and the Pangkaunlaran Development Association Incorporated (PDAI) with 468 household beneficiaries respectively. According to Ms. Sharlyn Altavano, the MCCT Coordinator, both the DSWD and the two CSOs are still on the process of completing their target beneficiaries totaling to 200 households for DSWD-run and 1, 000 households for CSO-run. Meanwhile, the conditions of the MCCT is similar with the regular CCT like the attendance to Family Development Sessions, attendance to Alternative Mode of Learning for education and visit to health centers for health. One condition added is that beneficiaries should have a permanent residence after 6 months of social preparation. In photo: A love worth declaring. Mr. and Mrs. Ronald Balbuena, proud adoptive parents with their son“Tyrone”. She is a teacher by profession. For how many years of staying in her chosen profession, she never gets tired of molding and teaching her pupils. She believes that it is not only a profession but also mother to these innocent learners. Spending years as a dedicated teacher and a mother, she met her man and became her husband. In their two years of marriage they were excited to build a family on their own. They wanted a child but it was so uneasy for them to have it. For quite long, they undergo several check-ups and visited hospitals to get advices from the experts. Until both of them decided to just leave everything to God. They believe that God has perfect timing and purpose for everything. Time and trials really tested their patience, for how many years they were not still given a child. Until she considers the idea of adopting, it was not easy for her to open up to her husband. But time really decides for them. She seeks help to her sister who is actually working at DSWD. They have gone through the matching conference, legal processes and attended the several seminars until finally they were given a special gift which later on they named as “Tyrone”. The child was only one year and six months then. But according to her, when she saw her son he already felt it that “Tyrone” is indeed her son. The trials and challenges do not end there; they experienced hardship of introducing the child to the whole family most specially that her mother-in-law is against in the concept of adopting. It took some time until her mother-in-law accepted “Tyrone” as a member of their family. Despite the unsolicited advices from others, the love they have for “Tyrone”, made their family even stronger. One of the biggest trials that they have encountered is when “Tyrone became sickly. This trial really tested them on parenting and also in financial concern. According to them “Tyrone” was never a burden and he will never be. She shared that since the day that “Tyrone” came in to their lives everything has changed. They experienced immeasurable happiness and they already felt the completeness of having a family. As the cliché says that “there is no perfect timing and they will never be ready to it” confrontation came. “Tyrone” asked them if where did he come out, they were shocked but they know that there is no easy way in telling the truth. It was really hard for them to explain to their son at his early age. But she remained calm and explained to his son patiently and slowly. She told her son that he has two mothers and in this it doesn’t make him a lesser person instead a blessed one. She was glad that “Tyrone” took it in a right way and he is even proud to share it in their classroom. According to them they are really thankful to God that they given them “Tyrone”; a smart and talented boy. They consider him as their best luck. Later on she got pregnant to a beautiful baby girl, she confessed that because of “Tyrone” they were so blessed and so many prayers were answered. They never felt even more complete as what they are experiencing right now. In photo: ARD Ponciana P. Condoy emphasizes on the unconditional love of adoptive parents to their adopted children, truly, the adopting a child is a true love worth declaring. 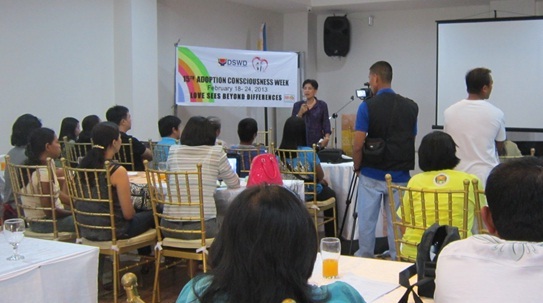 As part of the celebration of the 15th Adoption Consciousness Week, the Department of Social Welfare and Development Field Office II conducted an Adoption Forum at Hotel Carmelita, Tuguegarao City, on February 28, 2012. Bannering the theme “Loving Beyond Differences”, the Forum was attended by couples who have adopted children from the Reception and Study Center for Children (RSCC) or referred to as the adoptive parents, and with couples who are planning to adopt or the potential adoptive parents. The Social Welfare Officers from the SWAD of Cagayan, Isabela, Cagayan and Nueva Vizcaya were also present during the activity. Meanwhile, Atty. John Amador L. Malana, who discussed about the Process Flow of the Legal Aspect of Domestic Adoption, said that couples who have simulated the adoption of the child are criminally liable. Adoption is the legal process by which a child becomes the legitimate child of the adopting person/s. Simulation of birth on the other hand occurs when a childless couple, for example, comes into possession of a baby or child, given to them by a midwife, an unwed mother or a relative, and this couple then applies for a birth certificate, making it appear that the baby or child is their biological offspring. Atty. Malana emphasized that it is very important that adoptive parents will be given an Adoption Decree by the court, which legalizes their custody over the child. “Pag ang adoptive couple ay nabigyan na ng Adoption Decree, yun na rin ang magiging proteksiyon nila. Kahit mismong biological parent o birth parent ay wala ng habol sa bata,” Atty. Malana added. He also discussed other salient topics regarding adoption like the process of adoption and its requirements. Three adoptive couples shared their testimonies regarding adoption and the change it brought to their lives. Mr. and Mrs. Ronald Balbuena of Baggao, Cagayan, who became parent to Tyron, a child from the RSCC, said that since Tyron came to their lives, everything changed, for the better. “Nung una ang daming problema, kasi may mga tao na hindi pa rin open sa pag-aampon, but still we said to ourselves that Tyron is for us. Lahat ng pagsubok ay kinaya naming, lalo at napakasakitin ni Tyron noon. But thanks to God because he grew to a healthy and smart boy,” said the happy couple referring to their cute baby boy. Also, Mr. and Mrs. Ireneo Nuñez of Ilagan, Isabela said that having Josther, also a child from RSCC, made their relationship stronger. According to Mr. Ireneo Nuñez, he became a more responsible husband since he became father to Josther. “Dati kasi pag Friday gumigimik ako, pero nung nandiyan na si Josther, medyo nabawasan na. Umuuwi na rin ako kaagad after work. My wife and I are very happy because we now have what we can call a family,” said Mr. Ireneo. In photo: (from left) Regional Director Violeta A. Cruz encourages Civil Society Organizations to share their inputs and recommendations for the finalization of DSWD 2014 budget preparation. (from right) A representative of a Women’s Organization shares her comments on the proposed budget on a specific program of DSWD which is related to her sector. Tuguegarao City-–In line with the Department of Budget and Management’s memorandum circular to integrate citizen’s participation in the budget process as means of enhancing transparency and accountability in the allocation and utilization of public funds, Department of Social Welfare and Development (DSWD) Field Office 02 conducted a regional consultation with Civil Society Organizations on the preparation of 2014 budget held at Crowne Pavilion, Tuguegarao City on February 26, 2013. This was attended by Philippine Chamber of Commerce Inc. (PCCI) Cagayan Chapter, Pangkaunlaran, CAVAPED, Green Meadow Development Foundation, Alalay sa Kaunlaran (ASKI) Inc., Kalipunan ng Liping Pilipina (KALIPI), Federation of Senior Citizen’s Association of the Philippines, CLAIM, Regional Women with Disabilities, Providence Rural Band, academe, media and partners agencies from National Economic Development Authority and Department of Budget and Management. DSWD Regional Director Violeta A. Cruz, encouraged the CSOs to actively participate in the regional budget consultation for their inputs play a significant role in the finalization of DSWD budget preparation. Director Cruz also emphasized that the department has been consulting civil society organizations to strengthen and promote the principles of good governance by involving them in budget preparation for the different programs implemented by DSWD. Meanwhile, Ms. Rowena Arugay, DSWD Field Office 02 Budget Officer has presented a total budget of P1,782, 461,571.00 for Calendar Year 2014 including the locally funded projects and funds for Centers and Institutions. The participants of said consultation gave their inputs, comments and recommendations on the proposed budget particularly on programs that are related to their respective sectors. This is the battlecry of the “Bawal ang Epal Dito” campaign which was emphasized during the guesting of the communication officers of Department of Social Welfare and Development Field Office 02 in the Tipon-Tipan sa PIA at the Conference Hall of Philippine Information Agency, Regional Office 02, Tuguegarao City. Tipon-Tipan is a weekly media forum which is being aired live in major cable and radio stations in the Cagayan Valley region. Since the election is nearing, politicians are employing different antics in order to gain voters to the extent that they use some of the programs of the government especially the Pantawid Pamilyang Pilipino Program, a Conditional Cash Transfer (CCT) program of the government which is implemented by DSWD in the 17 regions nationwide. “It is important for our beneficiaries that they will be empowered with the knowledge that no politician can remove names from the program, so they should not be threatened whenever there are local chief executives who claim that they can,” said Maricel B. Asejo, the Information Officer for Pantawid Pamilya. It was also stressed that since the beginning, the Pantawid Pamilya is already free from any politicking because the beneficiaries were identified through the National Household Targeting System for Poverty Reduction (NHTS-PR), which is an another special project of the department. “Ang ating mga beneficiaries po sa Pantawid ay natukoy sa pamamagitan ng NHTS-PR, na proyekto ng DSWD, kaya maging sa pagtukoy ng beneficiaries, wala pong partisipasyon ang sinumang local chief executive o barangay captain,” said Ailyn Aglaua, Administrative Assistant of NHTS-PR respectively. As early as December last year, the Field Office already started advocating the campaign through the use of different medium such as tri-media guestings and interviews and press releases. The “Bawal ang Epal Dito” campaign is being implemented nationwide to ensure that the programs of the department especially the Pantawid Pamilya will be politics-free and will not be used for the advantage of any politician. The Pantawid Pamilyang Pilipino Program is a human development program of the national government. It is also a social protection strategy that invests in the health and education of poor children age 0-14 years old. It is widely known as the Philippine conditional cash transfer program. As of January 9, 2013, the program has 3,843,502 household beneficiaries and operates in 1,605 cities and municipalities in 79 provinces in all 17 regions nationwide. Tuguegarao City—To support the thrust of the government to provide sustainable interventions to disadvantaged youth to improve their plight and condition and to empower them through skills training and assistance towards gainful employment and entrepreneurial activities, Department of Social Welfare and Development Field Office 02 headed by Regional Director Violeta A. Cruz launched the Cash-For-Training (C4TP) Program held in Tuguegarao City. The Cash-for-Training program is a nationwide joint project of DSWD and the Technical Education and Skills Development Authority (TESDA). Qualified beneficiaries of this program are the disadvantaged youth who have been assessed as eligible under the expanded Government Internship Program of the DSWD, must be 18 to 30 years old, out of school youth (OSYs) both elementary and high school graduate, college graduate without employment and they must also come from indigent families. The DSWD will give financial assistance of P20, 000 pesos per beneficiary, does the profiling and identifying of youth beneficiaries through its Local Government Unit counterpart while TESDA will be in charge on skills training and development. The P20, 000 pesos per beneficiary will be allotted for scholarship vouchers, assessment fee, entrepreneurship, allowance, tool kits and training cost. In her message, Director Violeta A. Cruz encouraged the beneficiaries to maximize the opportunities given to them so that in return they will help their families to augment their financial needs. Director Cruz also emphasized that the program empowers the disadvantaged youth through skills training and assistance that will enable them to practice trade and venture into gainful occupation.